Witebska 6 - Reach for the future. Invest in the future. Why should you choose Witebska 6? 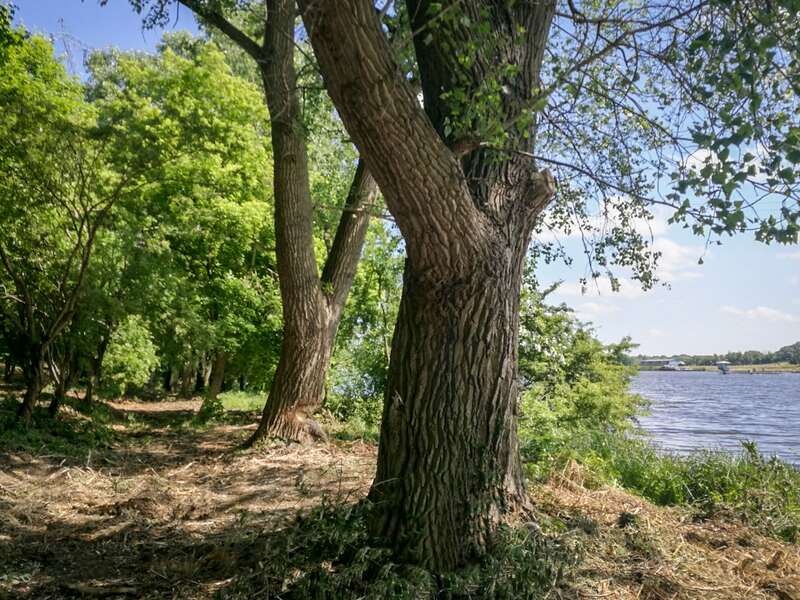 Investment plot located at Witebska 6, Bydgoszcz, Poland is a luxury location along the inland waterway. The property is situated along the shore of the Brda River (150 meters long) in a quiet district. There are many new investments in the neighborhood. One of them is – made by the Bydgoszcz City Hall – construction of a marina in the vicinity of this investment plot in Bydgoszcz, Poland. Witebska 6 is a perfect place to invest in Bydgoszcz, Poland for a tourist, business or sports and recreation purposes (e.g. a hotel with a marina, a guest house, a holiday resort including training center and nautical tourism, holiday flats) and others. Quiet, fresh air and lots of greenery. Driving along Witebska street in Bydgoszcz, Poland you can find a few houses only. 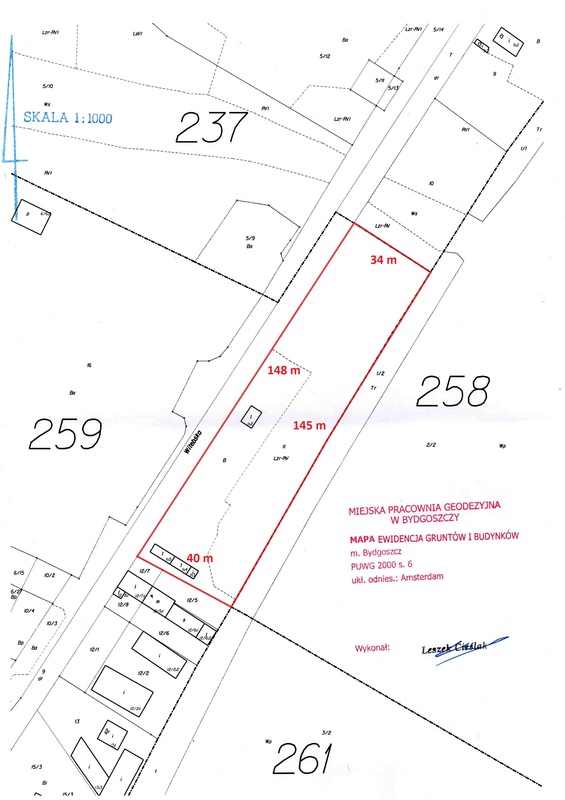 This investment plot located by the Brda River has a unique history – there are remains of an old villa with a park which stretches along the river bank. The investment plot no. 11 with an area of 5285 square meters is located at Witebska 6, Bydgoszcz, Poland along 150 meters of the Brda River shoreline. Property price: € 514 000. Direct sale by the owner. It is possible to make an appointment for those who are interested in purchasing. An improved land – there are energy & water supplies as well as sewerage infrastructure. It is a plot with a good, asphalt approach road – exit from Fordonska into Wyszogrodzka street, which leads directly to the plot located at Witebska street in Bydgoszcz. The real estate is located at Witebska 6, Bydgoszcz (Fordon - Brdyujscie), Poland, along the Brda River, next to the regatta racecourse, in the area of the water lock, weir and hydroelectric power station, which are part of the Bydgoszcz Waterway Node. At hand, there are many shopping centers, schools and colleges, entertainment venues, medical clinics and various service points, available just in a few minutes by foot or even less by car. In addition to the location, we have to mention about the special kind of a relationship between people and the river - their enthusiasm and commitment, as well as interesting solutions made along the Brda River, play an important role in the development of water sports and sailing in this area. In the close vicinity of this investment plot, there are a motor boat club, a water sports club, and a yacht club. Revitalization of the area has contributed to the organization of events such as Bydgoszcz Triathlon, Bydgoszcz Water, Regatta Championships, Bydgoszcz Slackline Games and others. A tourism in the surrounding region should be emphasized. Undoubtedly, one of the most important advantages associated with the Brda River is The Lemara Barge, Mill Island or the marina. During the cruise on the Brda River, you can notice renovated water locks, weirs, boulevards as well as private investments such as The Nordic Heaven or The Słoneczny Młyn. Due to the revitalization and development of a tourism related to the Brda River, the City of Bydgoszcz took part in a contest promoting water tourism, organized by the World Travel and Tourism Council - the only one organization which represents the private tourism sector worldwide. There is a lot of different information about this real estate that was collected by history enthusiasts on the Internet. After archival research, it is already known that the villa located at Witebska 6, Bydgoszcz was built by the Polish optician Stanisław Zakaszewski. In 1906, he founded an optical warehouse in Bydgoszcz, Poland - the first such warehouse in this country. In 1925, Witebska 6 was listed in a pre-war Polish phone book as a farmer's property. However, a farmer was not able to afford such a villa at that time, due to low earnings and low social status. It should be assumed that there was previously built a poorer, tenement house at the same address at that time. Stanisław Zakaszewski, optician was listed as an owner of this property in a phone book from 1926 for the first time. It can be presumed that the construction of a villa began in 1926. 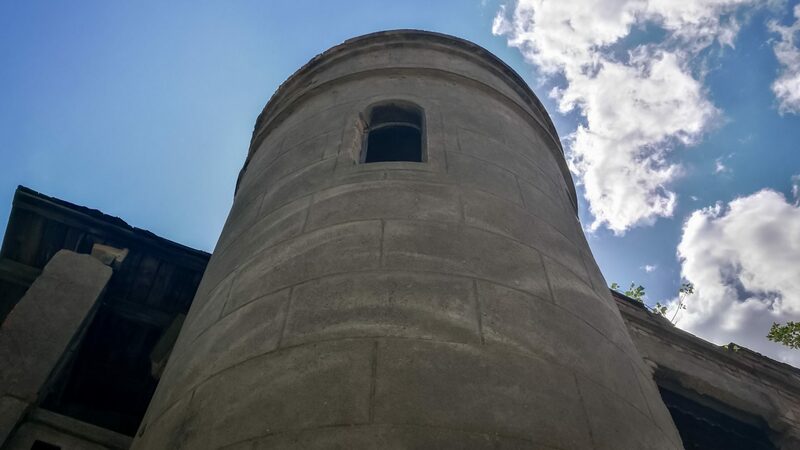 There is an eye-catching alcove tower in the corner of the villa (there was a winding staircase inside). From the north, there was a balcony with a view of the park. From the east (towards a river), there was a flower garden. From the west (street side), there was a decorative, brick fence. As a result of the outbreak of World War II, the property passed into the hands of the Nazi invader. According to the materials collected in the Federal Archives of Germany (Bundesarchiv), the property was a resort of the German Red Cross at that time. After the WW II, it went under city administration. Due to neglect, the once-bustling villa has partially collapsed. 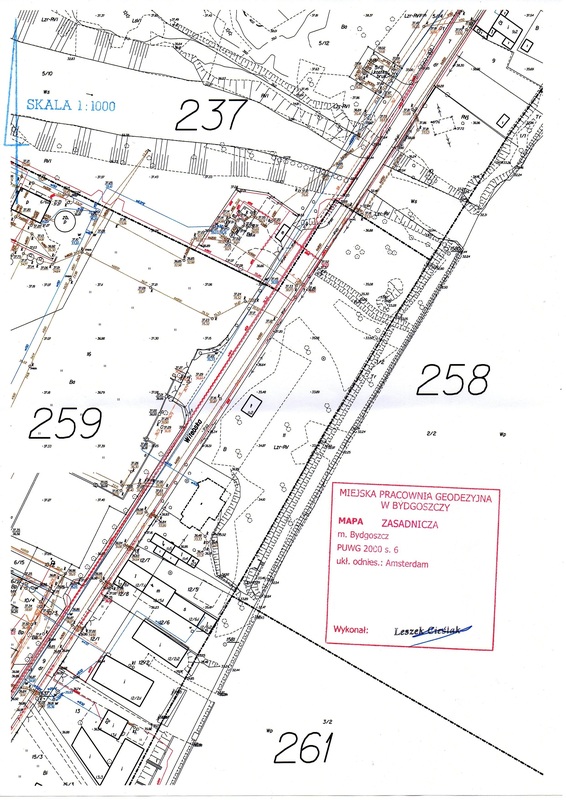 There are documents ready for download below, related to the property located at Witebska 6, Bydgoszcz, Poland. 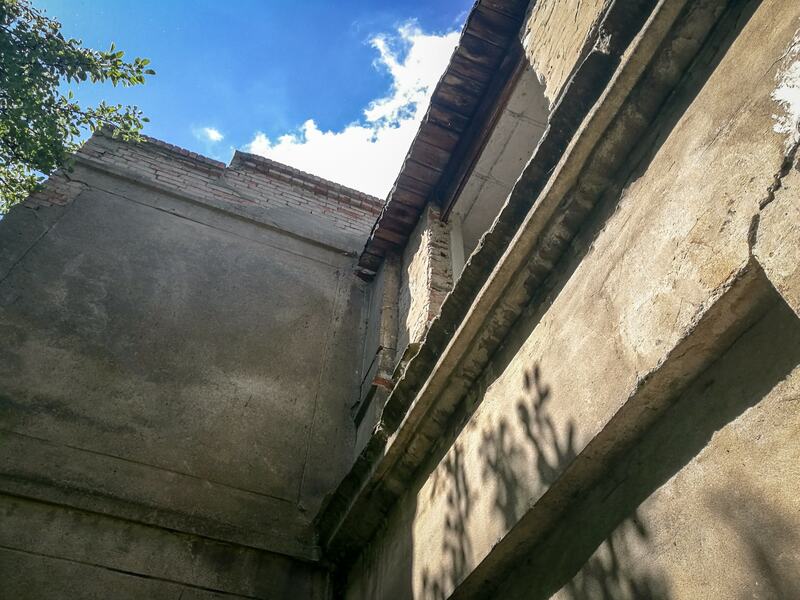 Fortunately, despite the checkered history of World War II and years of communism in Poland, floor plans (which were approved in the past by Nazi occupation authorities) have survived to the present day - the new owner (buyer) has the opportunity to rebuild the villa. 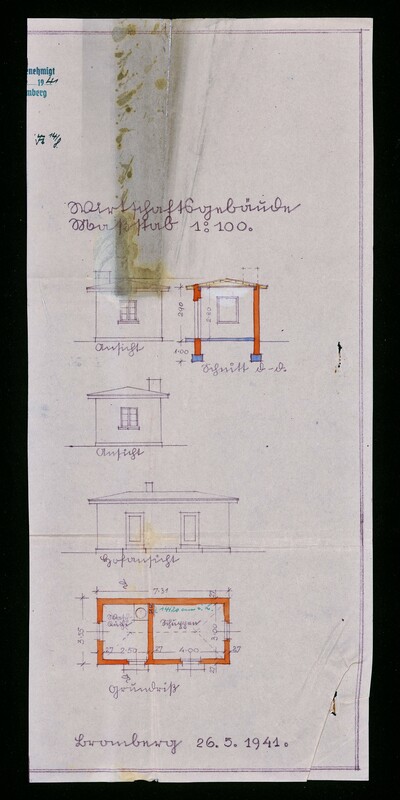 These documents were scanned in high resolution and fixed. Visible handwritten notes were made in German language in so-called Sütterlin script. 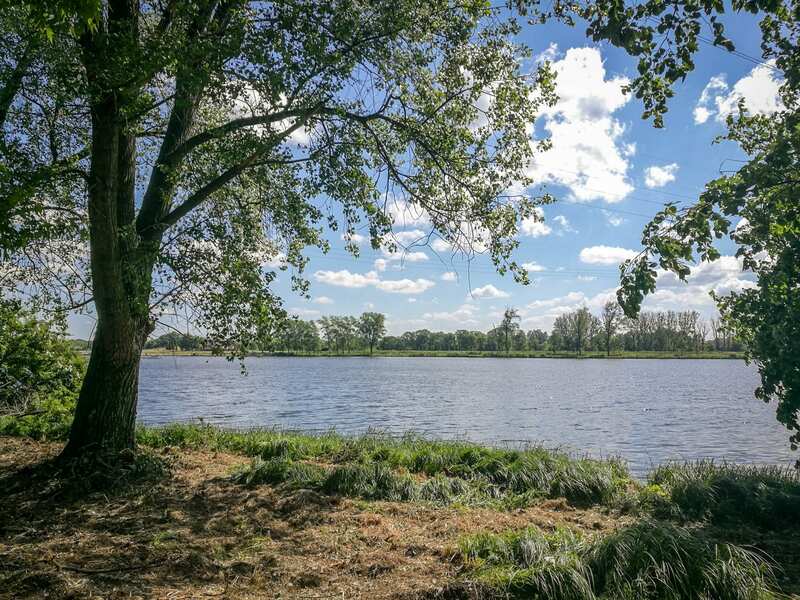 An investment plot located at Witebska 6, Bydgoszcz, Poland is situated near the regatta racecourse and so-called old "Water Lock Keeper's House" located at Łowicka 56, Bydgoszcz. Why do we mention this? According to the letter received from the Bydgoszcz City Hall, the "Water Lock Keeper's House" - a historic tenement house located at Łowicka Street, Bydgoszcz is going to be adapted as a hotel due to the construction of the marina which will play an important role in creating many new opportunities for new investments in the area. „Gazeta Wyborcza” Newspaper published an article about an investment made in 2018 for the estimated value 4 million PLN - construction of a new spectators box and a boathouse at the regatta racecourse in Bydgoszcz, Poland. This investment will increase a popularity of the area through arranging more events such as regattas, competitions, and water races. It is possible to apply on your own for EU funding for the construction of a harbor, which would certainly be an advantage due to lack of avaiable docking space for vessels on the Brda River. Also, it is possible to build an additional residential accommodation in the form of a floating house, along the shoreline on your own. Copyright ⓒ witebska6.pl. 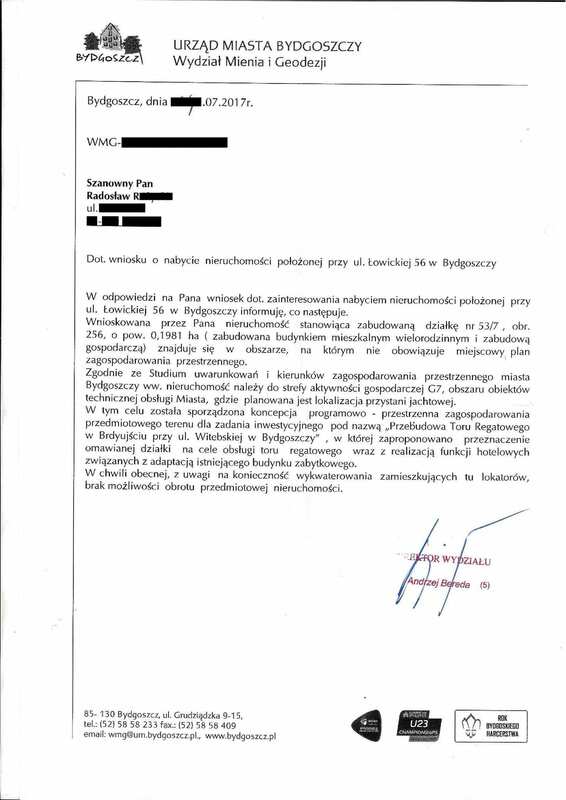 Wszelkie prawa zastrzeżone.